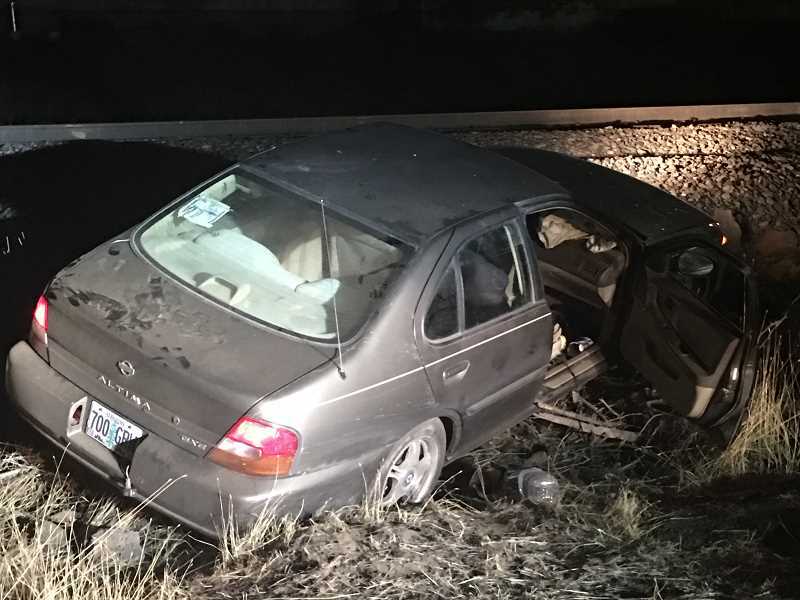 Four people, including a Prineville resident, were arrested after a brief vehicle pursuit, crash into a railway embankment and foot pursuit. Deschutes County deputies later recovered a stolen pistol, methamphetamine and heroin during their arrests. On Monday evening, around 8:40 p.m., a Deschutes County deputy was driving in the area of Southeast Wilson Avenue and Southeast Third Street in Bend, when they noticed a brown Nissan Altima began driving suspiciously through a parking lot and avoiding the patrolling deputy. The Altima left the retail shopping center parking lot without yielding to oncoming traffic on Third Street, prompting the deputy to activate his emergency lights and siren to conduct a traffic stop for the violation. The Nissan sped away before quickly, turning onto Miller Avenue. The vehicle pursuit lasted about two minutes and speeds ranged between 45 and 50 miles per hour. The vehicle then came to a stop when it turned into a dead end right-of-way used by Burlington Northern Railway. It appeared the Nissan was trying to cross up and over the railroad tracks. After the car came to rest on the railroad embankment, the driver, later identified as 29-year-old Bend man Lonnie Fosburg, and his three passengers, 44-year-old Michael Vincent Dorazio, of Corpus Christi, Texas, 20-year-old Bend resident Cheyenne Porter, and 39-year-old Bobby BJ Moody, of Prineville, all fled in different directions throughout the neighborhood. Deputies and Bend police officers converged on the scene and quickly located Fosburg running from the scene. He was arrested after a brief struggle with deputies. Authorities located a user amount of controlled substances in his possession. The passengers were all captured without incident. Fosburg was later transported to St. Charles Bend for a medical evaluation prior to being lodged at the Deschutes County Sheriff's Office Adult Jail. The passengers were likewise lodged in the Deschutes County jail. During a subsequent investigation, a stolen pistol was found inside the Nissan, that authorities determined had been stolen in a May 2018 during a residential burglary in Redmond. Fosburg was charged with one felony and one misdemeanor count of fleeing or attempting to elude a police officer, felon in possession of a firearm, first-degree theft, possession of methamphetamine and heroin, interfering with a police officer, resisting arrest and probation violation. Moody was charged with fleeing or attempting to elude a police officer, felon in possession of a firearm, first-degree theft and possession of methamphetamine. Dorazio and Porter were both charged with interfering with a police officer and fleeing or attempting to elude a police officer, and Porter was also charged with probation violation. There were no injuries or property damage reported. However, Burlington Northern Railroad suspended train service for investigators' safety until the Nissan was removed.